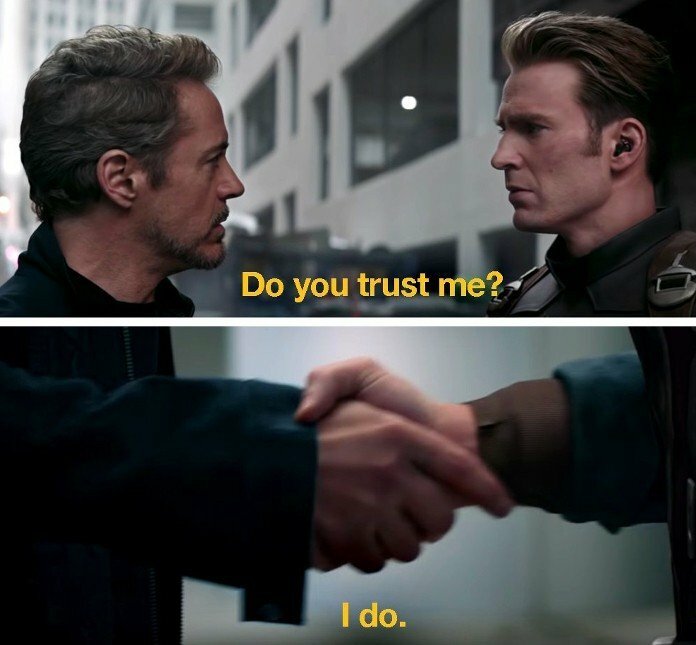 One of the most moving moments in today’s newest Avengers: Endgame trailer is the scene which finally reunites Tony Stark and Steve Rogers for the first time since 2016’s Captain America: Civil War. Taking place in what looks to be a New York street, Iron Man asks Cap if he trusts him to which the super-soldier says he does. They then shake hands, a sign that the bad blood between them has been put to the side. But is that what’s really going on here? An intriguing theory has been suggested by ScreenRant and other fans that this scene might be an example of how the trailers have been deliberately tampered with to avoid spoilers. The Russo brothers have even been up front about this, so it’s not out of the question. The theory goes that Cap has been digitally-altered here to hide the fact that this clip comes much later on in the movie than the rest of the footage in the trailer. It might actually hint at the time travel plot to come, too. Is There A Time Travel Spoiler Hidden In The Latest Avengers: Endgame Trailer? Note that Tony’s lighter hair and outfit is the same look Robert Downey Jr. sported in set photos that seemingly confirmed Endgame would revisit the events of The Avengers. These pics saw an older Tony interacting with a 2012 Cap, complete with that memorably bright costume. The theory says that this scene is actually a time-traveling Stark asking the young Steve to aid him in his mission to change the future. It might pay to closely inspect Cap’s suit in the image above as well. He’s wearing his battered, star-less outfit from Avengers: Infinity War when the rest of the footage shows him in either a repaired Winter Soldier-style suit or a new Civil War-eseque one. This discrepancy would make sense if the IW suit was papered onto the scene with CGI. What do you think, though? Is there any truth in this? Let us know in the comments section before we get to see this scene in context when Avengers: Endgame hits cinemas on April 26th.